Administration of tranexamic acid (TXA) is integral part of the management for major trauma patients in the UK. It is deemed such an important aspect that its administration is used as a quality indicator to benchmark major trauma centres across the country. TXA is a medication that has raised a fair degree of controversy, mostly in the US, and whilst the current evidence base is not perfect (Ed – there is no such thing as a perfect evidence base outside of n=1 trials), we believe that until new evidence arives to the contrary then we should be giving it to our major trauma patients. If you go back to the original CRASH 2 paper you will know that they enrolled patients up to 8 hours post injury. That’s a pragmatic approach, but with many bleeding deaths from trauma taking place before that it does not quite fit with the pathophysiological model. In that study there was a strong signal that earlier treatment benefited patients more, but how can we look at this from a wider perspective? 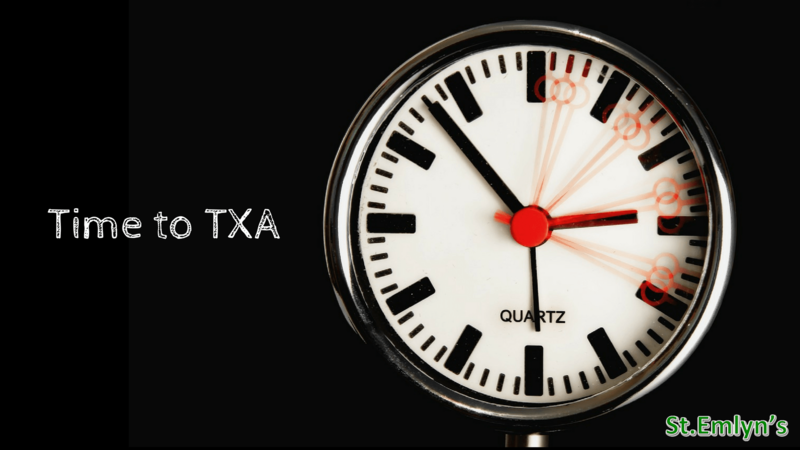 Arguably a secondary analysis looking at dividing patients into time bands from more than one trial, as to when they get the TXA might suggest whether there is a time to treatment effect. This week a really interesting article in the Lancet1 (you can access it here) reinforces the pivotal role and safety profile of this drug in the prevention of traumatic bleeding, and attempts to further investigate the time to treatment effect in TXA. The St.Emlyn’s team have had a look and summarised this promising paper for you but as always we do suggest you read the original article in full before you draw your own conclusion(s). The effect of treatment delay on the effectiveness of antifibrinolytics in patients with acute severe bleeding was controversial (to some), or rather we could not be certain from the studies that are already in press. They did so by conducting an individual patient-level data meta-analysis of randomised placebo-controlled trials done with more than 1,000 patients. Individual patient meta-analysis is a pretty coool approach where instead of combining the pooled results of trials, the authors are able to dig into individual patient data and pool them as one study. This is arguably more powerful and more reliable than simply pooling trial summaries4. Primary outcome: death from bleeding. This is interesting and a bit controversial. Deaths from bleeding are a subgroup of all deaths and it’s possible that there would be a bias towards a positive TXA effect by doing so. Whilst we understand why they went for bleeding deaths as a primary outcome we think it’s very important to report overall mortality too. They did do this, but it’s a bit tricky to find. What were the results then? TxA significantly increased overall survival from bleeding OR 1.20, 95% CI 1.08-1.33, p=0.001. You have to dig into table 2 to find out what that means in terms of real patient difference and it’s an absolute risk reduction difference of about 0.6% (Ed – a much better way of describing it). That’s interesting and perhaps a little less dramatic as a result . As you know, an absolute risk reduction of 0.6% means that the number needed to treat is about 166 for all bleeding mortality. It was estimated that the treatment benefit benefit decreased by 10% for every 15 minutes of treatment delay, and so if you are looking for a significant clinical effect, early administration seems to be the way forward. What were the authors’ conclusions? The authors concluded that death from bleeding occurs soon after onset and even a short delay in treatment reduces the benefit of TxA administration. This meta-analysis is not without some flaws as detailed above but it appears to further establish the role and safety profile of TxA in the management of major trauma patients. Or, is the pragmatic question not what will you folks change in your daily practice in order to ensure that TxA gets to your trauma patient sooner rather than later? Tranexamic acid needs a make-over.